God is "Raso vai sah", Baba has often said, which means that God is the Divine Ambrosia. He is sweet, sustaining and strength-giving. The different forms of the Divine like Rama, Krishna or Jesus are but differently designed cups through which the ambrosia that is God can be imbibed, experienced and enjoyed. And among the various forms of the Divine, the elephant-headed Lord, Ganesha, is perhaps the most bewitching, the most charming and the most celebrated. Since ancient times, Ganesha has been worshipped as the Lord of all knowledge, intelligence and wisdom in India and many other parts of the world. The extraordinary figure of Lord Ganesha has been a source of joy to many devotees since the time man started worshipping His beautiful form. With a big belly, beautiful tusk, baby-elephant head, penetrating eyes, four arms, handsome ears, and all these harmoniously balanced, Lord Ganesha’s form is most enchanting and blissful. 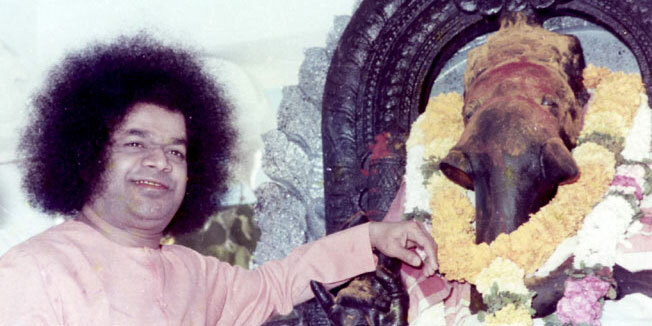 Baba has explained that the elephantine head signifies intelligence and leadership qualities. The elephant in the jungle is a symbol of might and magnitude and when there is no path in the jungle, it is the elephant that walks through and creates a path and shows the way. 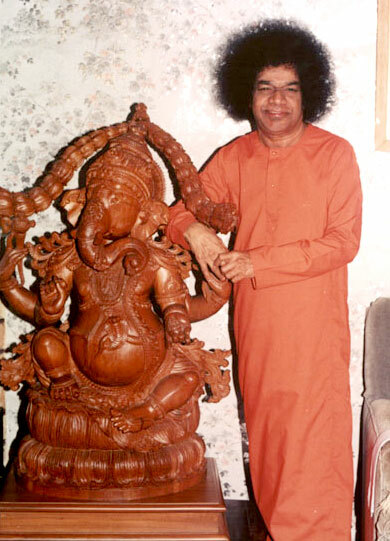 It is the same with everybody’s lives, Swami says - the elephant-headed Lord Ganesha shows the ideal path for all to tread. The elephant has great patience and forbearance. It is not only highly intelligent but is also known for its fidelity and gratitude. It is prepared to sacrifice its life, but it can never tolerate its master's suffering. Intelligence without gratitude is valueless, Swami explains. On devotees’ reservations concerning how the rat can be the vehicle for Lord Ganesha, Baba clarified that the rat which likes to move in darkness represents ignorance. 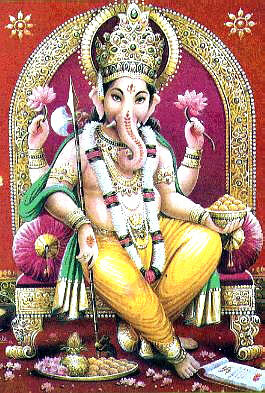 Ganesha is regarded as the one who subdues ignorance and dispels darkness. He symbolizes the triumph of wisdom over ignorance and of egolessness over desires. “These steam-cooked offerings with no oil are unique and special. Til seeds, rice flour and jaggery are mixed, made into balls, boiled in steam and offered to Lord Vinayaka. You should enquire into the purpose of making such an offering. These steam-cooked offerings (modaka) are good for the eyes, they free us from all defects of the eye like spots and cataracts and are beneficial to people suffering from asthma and eosinophilia. A combination of jaggery and til seeds prevents all defects and diseases caused due to bile (vatha), wind (pitha) and phlegm (cough). The rice flour preparation helps in digestion too. It is a time-honoured tradition to offer worship first to Ganesha before embarking on any undertaking or learning music, the fine arts or any branch of knowledge. 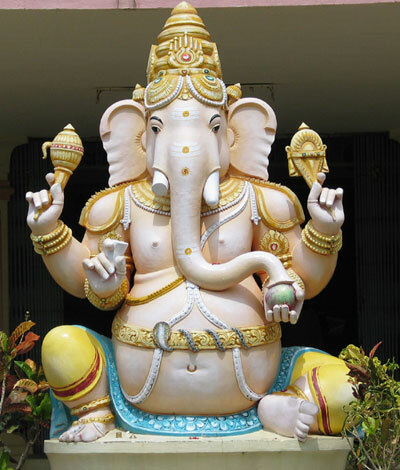 The popular belief is that Lord Ganesha instills purity in body and fearlessness in mind and removes all the obstacles coming in the way of any endeavour. It is for this reason that the first bhajan is always dedicated to Ganesha in all Sai Bhajan sessions. Worship of Lord Ganesha confers success at two levels, Pravritti (outward) and Nivritti (inward), spiritual as well as worldly. “If you want to lead a life of happiness, free from troubles and difficulties, you have to pray to Ganapathi, the remover of all obstacles,” Swami says. How Should We Pray to Lord Ganesha? Ganesh Chaturthi falls on the 7th of September this year – the sacred day to celebrate the advent of Lord Ganesha. Let’s remind ourselves of the holy ideals set by our Lord, Sai Ganesha, on this day and tread the path to His Lotus Feet as joyfully as a river merges with the ocean.